I am happy to finally announce that I have found a venue to start releasing my compositions for people to study. My compositions have been published in the past (only in expensive sets of parts – never as study scores), but only a small percentage of them have been available and they tend to go in and out of print. Thankfully – with a HUGE help from my copyists, Dave Rivello and Ryan Truesdell – that percentage of available charts is growing. 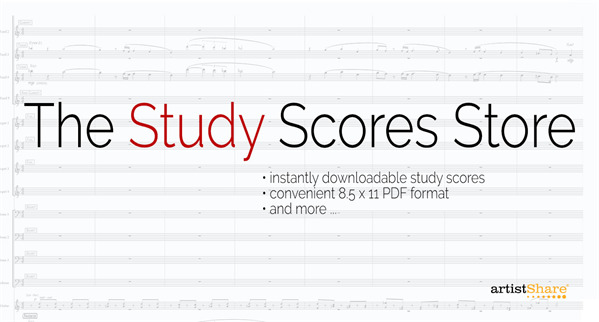 We are starting with 15 study scores – all never before published – and expanding from there. Be sure and keep checking as new titles will be added as they are copied/completed. However, because of the great venue we have in ArtistShare, I can finally offer you more than just notes on paper. I will be adding streaming audio of my thoughts on composition, how to rehearse a band, suggestions for soloists on how to approach my music, as well as much more. My hope is that you will not only get joy from studying my music, but to also learn a bit more about me, my music and my process. I’m so happy to finally offer this music to you and I hope you enjoy!! If you don’t see a title that you are interested in, please contact my assistant, Ryan Truesdell at ryan@artistshare.com. He will be able to tell you whether the title is available or not, and when it will be up on the site for you to purchase. If there are enough requests for a certain title, he’ll bump the title up to the top of the “To-Do” list.